Dr. David Lo was born in Ohio. He joined Ohio Gastroenterology Group in 2011 after completing an advanced endoscopy fellowship training program at Maine Medical Center. Dr. Lo is board certified in gastroenterology. 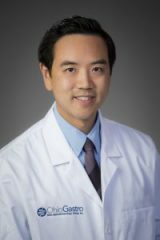 He is trained in all endoscopic procedures, including ERCP and EUS, as well as the endoscopic management of Barrett’s esophagus and early esophageal cancer, and complex pancreaticobiliary disorders. He was selected by his peers to be a Fellow of the American College of Gastroenterology (FACG) in 2016, Fellow of the American Society for Gastrointestinal Endoscopy (FASGE) in 2017, and Fellow of the American Gastroenterological Association (AGAF) in 2018. He has lectured and performed endoscopic demonstrations nationally and internationally. He has also published several scientific abstracts and articles and is a peer reviewer for the Annals of Gastroenterology and American College of Gastroenterology Case Reports Journal. Dr. Lo serves as an Adjunct Assistant Professor for The Ohio State University College of Medicine, and Clinical Assistant Professor for both Northeast Ohio Medical University and Ohio University Heritage College of Osteopathic Medicine.